NOTICE IS HEREBY GIVEN pursuant to the provisions of Minnesota Statutes 375.51 Subdivision 2, that the Otter Tail County Board of Commissioners intends to adopt the “Sanitation Code for Subsurface Sewage Treatment Systems”. The proposed ordinance revision will be considered at a meeting of the Otter Tail county Board of Commissioners in the Commissioners’ Room at the Otter Tail County Government Services Center, at 515 West Fir Ave, Fergus Falls, Minnesota, on Tuesday, April 23, 2019 at 1:00 p.m. The purpose of the proposed ordinance revision is to regulate the location, design, installation, use and maintenance of subsurface sewage treatment systems (aka septic systems) in all areas of Otter Tail County. Copies of the proposed “Sanitation Code for Subsurface Sewage Treatment Systems” are available here (linked below) and at the Otter Tail County Land & Resource Management department, located at 540 W Fir AVE, Fergus Falls, MN 56537. Recognizing the fact that the uncontrolled use of our land could adversely affect the health, safety and general welfare of the public, as well as impair the tax base, the county commissioners and the state have imposed laws and ordinances in an attempt to ensure a viable environment for the residents and visitors of the county. The Department of Land and Resource Management is designed to enforce county and state ordinances / rules. 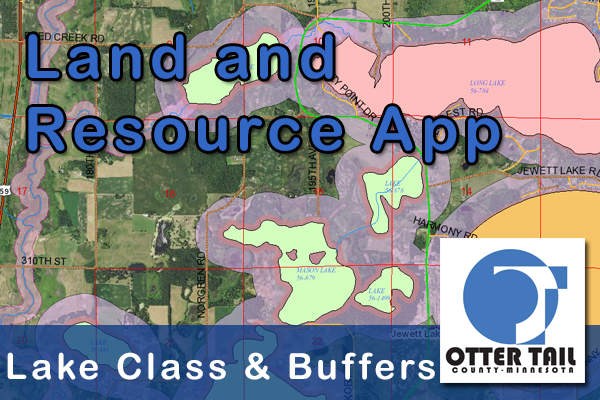 Click the image below to open the Land and Resources Map. *Applications not processed after 4:00 p.m.